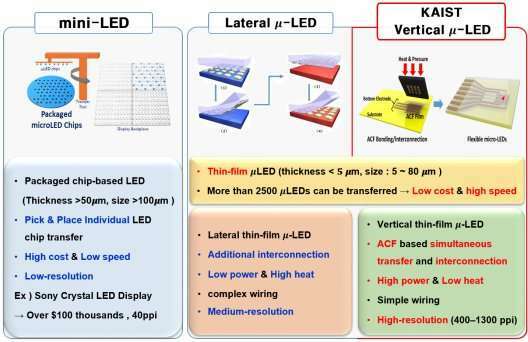 A KAIST research team has developed flexible vertical micro LEDs (f-VLEDs) using anisotropic conductive film (ACF)-based transfer and interconnection technology. The team also succeeded in controlling animal behavior via optogenetic stimulation of the f-VLEDs. Flexible micro LEDs have become a strong candidate for next-generation displays due to their ultra-low power consumption, fast response speed, and excellent flexibility. However, micro LED technology was previously inhibited by poor device efficiency, low thermal reliability, and the lack of interconnection technology for high-resolution micro LED displays. The research team has designed new transfer equipment and fabricated an f-VLED array (50x50) using simultaneous transfer and interconnection through the precise alignment of the ACF bonding process. These f-VLEDs achieved optical power density (30 mW/mm2) three times higher than that of lateral micro LEDs, improving thermal reliability and lifetime by reducing heat generation within the thin film LEDs. These f-VLEDs can be applied to optogenetics for controlling the behavior of neuron cells and brains. In contrast to the electrical stimulation that activates all of the neurons in brain, optogenetics can stimulate specific excitatory or inhibitory neurons within the localized cortical areas of the brain, which facilitates precise analysis, high-resolution mapping, and neuron modulation of animal brains. In this work, the researchers inserted the f-VLEDs into the narrow space between the skull and the brain surface and succeeded in controlling mouse behavior by illuminating motor neurons on two-dimensional cortical areas located deep below the brain surface. Professor Lee said, "The flexible vertical micro LED can be used in low-power smart watches, mobile displays and wearable lighting. In addition, these flexible optoelectronic devices are suitable for biomedical applications such as brain science, phototherapeutic treatment, and contact lens biosensors." A paper on these results titled "Optogenetic Control of Body Movements via Flexible Vertical Light-Emitting Diodes on Brain Surface" has been published in Nano Energy.